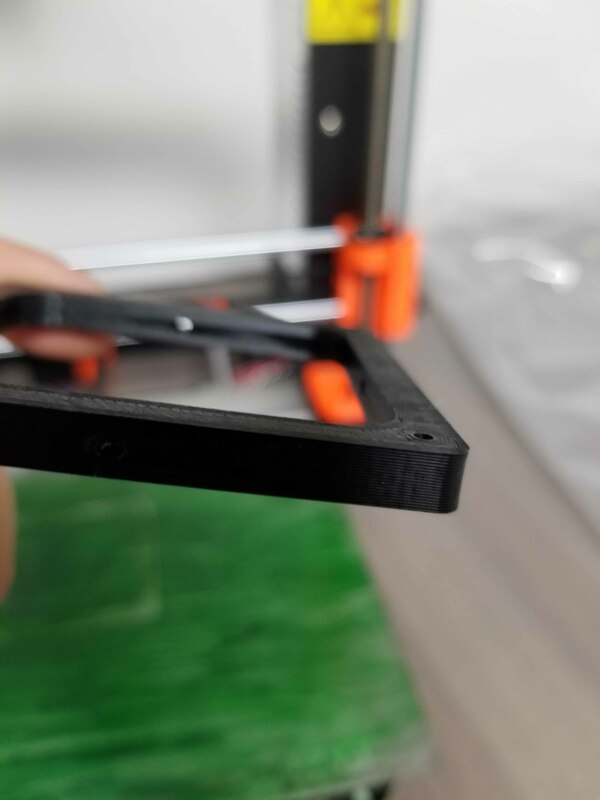 It is now possible to print directly on the metal plate of the PRUSA MK3 (by removing the PEI sheet, and cleaning the adhesive). We have many years of experience in printing with ABS mainly for industrial products designed in the company. Over the years, due to lack of good solutions against the ABS wrapping, we have come up with a totally new powder that mixes with water. The homogeneous solution can then be applied onto the bed using a brush, or squeegee. Once the print finished, the part is easily removed when the bed temperature falls below 50 degrees Celsius. Simply brush off with water the DustnPrint left on the first layer for a nice finish. If you wish to start a new print, just brush the solution in place with a bit of water or add a fresh new one. This product has forever changed our printing experience with ABS, and it might change yours as well. Attached, some pictures of the Prusa MK3 with the metal plate (PEI sheet removed) and a small part that has been printed. We are working on the site and will be updating more pictures (tons of examples). We are also using the powder for our larger printer 500mmx500mm with a glass bed. 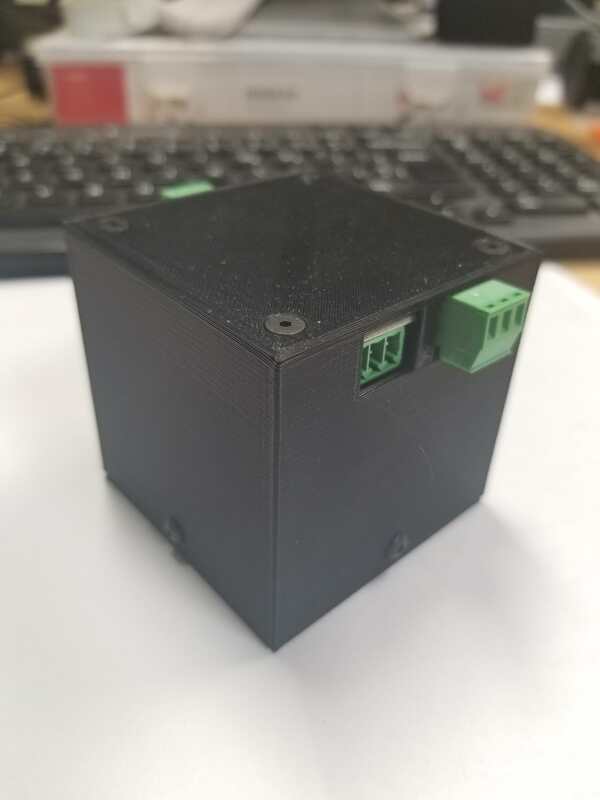 It can get tricky to print a nice box out of ABS, specially without enclosure. 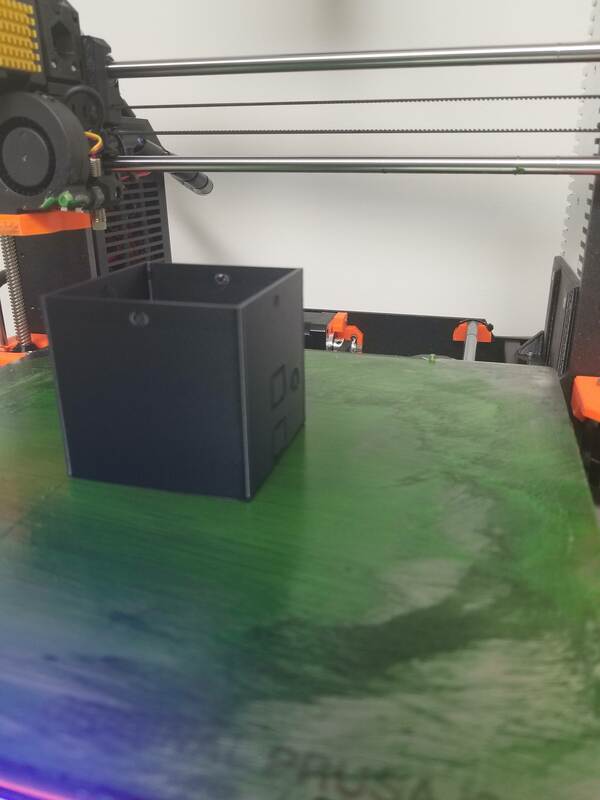 The following box was printed using the DustnPrint for the bed adhesion (www.dustnprint.com), on a PRUSA mk3 without any PEI (directly onto the metal sheet). If you have any questions, or perhaps suggestions or need some tips about ABS printing, just post your question, we will try to answer it the best we can based on the printing with ABS experience we have accumulated over the years. I found it difficult to find information on your website. 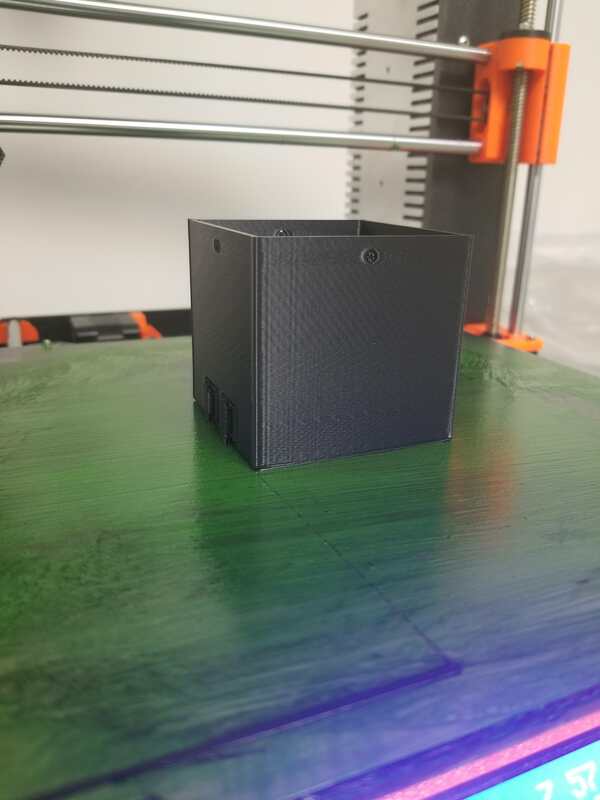 It looks intriguing, and as I am now set to dedicate one printer almost solely to ABS printing, and am of course having trouble with it warping (Also not very good layer adhesion) so something that saves me having to throw out half-finished prints would be very welcome. We are working on the website as we speak and will update all the missing information. Basically, on a normal Prusa MK3 you can print for at least 20 prints minimum if you wash the bed after each print, but if you wish, you can just add a bit of water to the solution already on the bed and brush it off, we had people printing 40 times using the same surface, they bought one bag and printed non stop for a month. Depends on how you use it. It really is the least expensive solution for ABS printing. I have uploaded a picture of our Creality (modified), with dustnPrint (blue color), over a glass bed, I will upload other pictures of different parts we get to print. As for the bed temperature, you really need to measure 100 degrees Celsius at least, on the bed for the ABS. The temperature of the nozzle should be between 245 up to 260, all depends on the part you are trying to print, and the speed of the print. Really Hope this helps clarifying few things. If you have any questions, just post your question, we will try to answer it the best we can. What is the package weight for Dust'n'Print, without Dust'n'Print what temperature do you normally set the enclosure to. When you want to clean the bed what is the best way to clean bed to remove of Dust'n'Print. The package weights about 25 grams (0.88 ounces). We haven't use any enclosure, it was printed directly open air (room temperature at 24 degrees Celsius). In order to clean the bed, only clothe with water will do the trick. You can check the website as we are pushing the updates on it with all information. Thank you very much for your feedback and questions. This could be a future solution for those wishing to keep their Prusa MK3 bed. 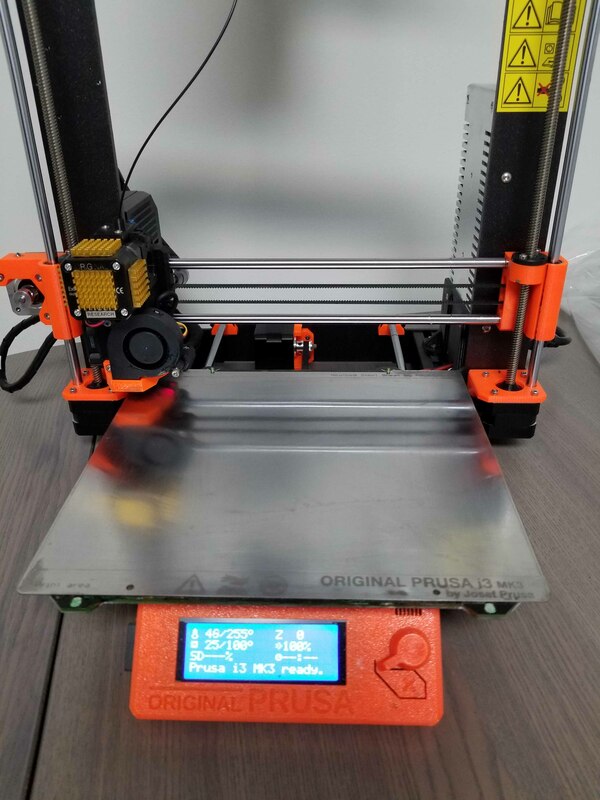 I will post a link on how to remove efficiently the PEI from the Prusa bed. Why would anyone want to take the PEI off the bed in a printer? PLA, TPU, and ABS all stick to PEI. 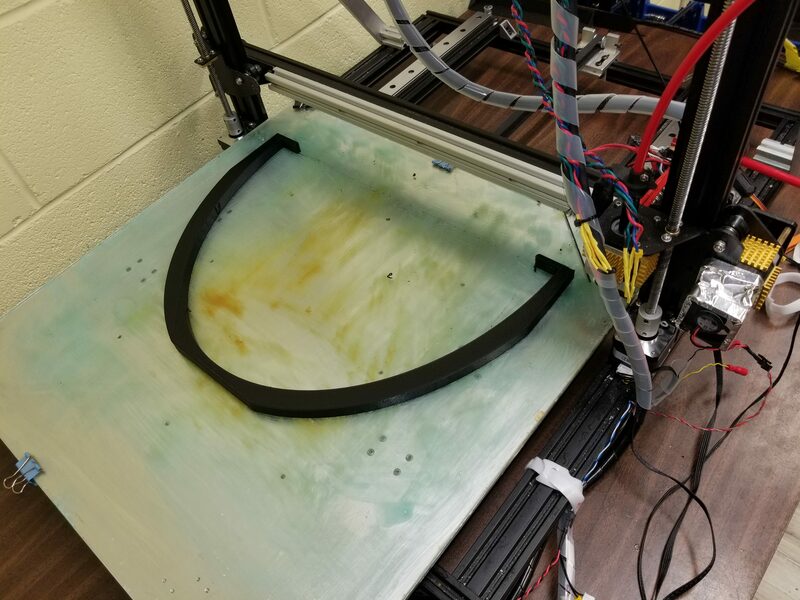 Noobs reading this thread might get the idea that a sticky bed plate is all you need to print ABS reliably. That is simply not true. The thing that makes ABS "difficult" to print is that it shrinks as it cools (which is why corners often lift off the bed plate). Larger, bulkier prints will delaminate (pull themselves apart at layer boundaries) if you print on an open printer. 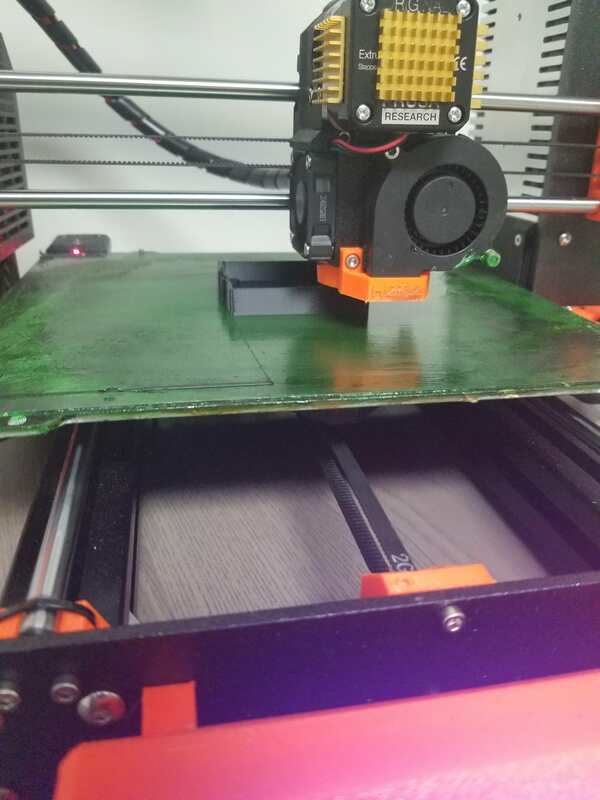 You do need a sticky bed plate, but that is only part of what you need to print ABS reliably. If your printer is built to print ABS, it is no more difficult to print than PLA. Thanks for the feedback. You have brought a good point, and maybe I have got misunderstood. The PEI works for ABS for few prints, if you print the same part over and over, after as few as 4,5 prints, the PEI's adhesive tends to un-stick on the part boundary, decreasing the effectiveness of the overall PEI sheet. The part will not have a straight, flat surface anymore. If your PEI sheet is still good, you can increase it lifetime using the DnP for instance. Otherwise, if it is used, you can simply remove it and directly apply the DnP. 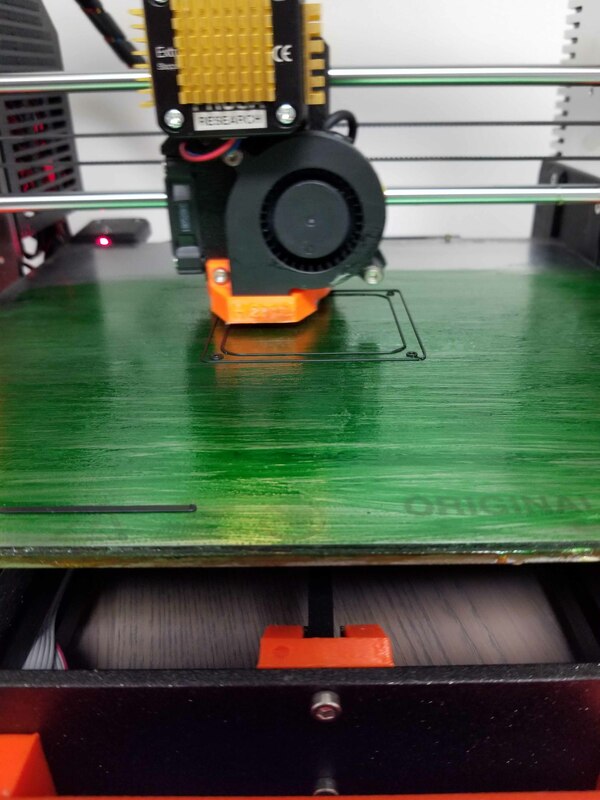 Your link looks really interesting and describes very well the main important things a 3D printer should have in order to print ABS smoothly. 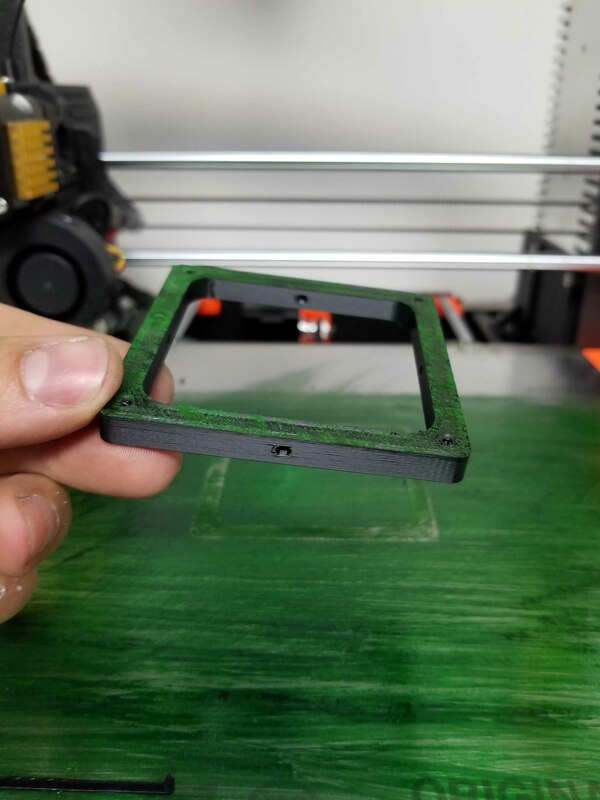 Besides maybe the enclosure, which is very good, but might not always be needed in order to print ABS (depending on the part). We tend to print more than maybe an average 3D printer, some weeks we tend to use easily over 6 Kg of ABS, hence repeat-ability as well as easiness of use are important for us to set up the print job, and have a successful printed part. We have tried and used all the advertised solutions on the market, and ended up coming with the DnP. Our clients are mostly people who have companies and who print a lot. We thought we would bring the same easiness of use and frustration free solution to everyone out there printing using ABS. Is the claim of 85 bed treatments accurate? It might be better to provide specific instructions for proper coverage as opposed to just 3 parts DnP to 3-4 Water. Say mix 1:1, it will take 3 scoops to cover specific bed size. 2 scoops for different specific bed size, etc. Edited 3 time(s). Last edit at 09/17/2018 03:04PM by FA-MAS. The claim of 85 bed treatments stem from the fact than instead of cleaning out the solution after each print, you can just leave it on the bed and brush it off a bit (a bit like Bob Ross used while painting the background ), while adding a small amount of new DnP each time (sometimes you do not even need to). We shipped in 2 bags, you got an extra one for free, you will be able to test it out and play around with it. As you will print more and more, you will get the twist. We are upgrading the website to include your suggestions regarding the bed size vs number of scoops. Once you get the bags, let us know how it goes, and if you have any questions, we will assist you. The PEI works for ABS for few prints, if you print the same part over and over, after as few as 4,5 prints, the PEI's adhesive tends to un-stick on the part boundary, decreasing the effectiveness of the overall PEI sheet. I don’t have a Prusa i3, but I do print on a sheet of PEI. When what you describe above starts to happen, I just use a piece of steel wool to scratch up the surface of my PEI sheet and then clean the PEI “dust” off with a glass cleaner. Do that once every 3-4 months and seen no issues with part sticking. Just reading through this post, how is your dust n print any different than the liquid print bite sells for abs, or even just using the gold ole abs slurry with acetone? From what I’ve seen those work on non-PEI beds for ABS adhesion. We came up with DustnPrint to meet these requirements the best based on the ABS parts we printed, the physical setup, the quantity, time, etc. That said, DnP will optimize best these parameters but other solutions out there might already work for others. It is really up to everyone to chose which of the above points is more important than others. If at any point in time, the present ABS adhesion solution does not meet your present requirements, DnP might be a very very good solution. We just wish to spread the word, it is out there, and it works. I did get my order, and thank you for the additional packet. I'll be testing this out sometime this weekend. Have a chance to test this out and am applying it now. Am I mistaken or is the green powder scented to smell like mint? i understand the reasoning why it needs to be vacuum sealed with desiccant inside. But I will say the contents had shifted to above the tear line on the packaging and it made it difficult to shift it downward so that it could be opened without losing any of the contents. I tried applications both with the bed hot and cold and believe the hot application worked best, the product appeared to get tacky almost as soon as it touched the bed and could only be brushed around for a second. Additional brush strokes over an already applied area would remove the previously applied product. With the bed cold, i could move it around wherever i wanted but for a first application, was unsure if it was going to dry. After the hot bed application, the product appeared to set up and is not tacky or anything to the touch. Yes sir, as DnP is not polymer based, we wanted to add a more natural smell to it. We are still exploring other color/flavor arrangements too. Yes, this may be because we overfilled it and the seal zip may have opened during transport; we are currently working with our packaging provider to explore what will be best going forward. With the bed cold, i could move it around wherever i wanted but for a first application, was unsure if it was going to dry. dry. We like to apply it during heatup, around 50-80C. When the bed > 100C, as you said it is a bit touchy to spread it. If it removes the previously applied DnP, you can try adding water. We will soon make a video on how to apply a uniform DnP surface with all the relevant infos. Make sure to set the bed to >120C (so that the surface temp is >105-110C)! Here's what my application looks like, done at 105C onto clean glass. It was difficult to get a uniform coat. And the differences in thickness show up on the bottom of the print. I think that maybe a foam brush might work better than a bristled one. Here's the part printed, printed with the bed at 105C and the extruder at 230C. Also no enclosure, AC was off and no drafts. It was definitely stuck down. Much better than blue painters tape or the PVA glue I had been using previously. As a test to see if any of the corners had lifted (they had before) I tried to slide a piece of paper under each corner. I could not. It looks adhered pretty we.. I could not pull it off the bed either. I walked away and as it cooled to around 60C, I heard a loud pop where it had separated from the bed. Here it is separated from the bed. It took some of the product with it. I found that brushing it with water doesn't spread the remaining product to fill in the missing spots rather than it just absorbs into the brush. I think a secondary application to fill the gaps would need to be necessary. Also even though it had adhered better anything else I had used. It still looks like there was some corner lift. Though no where near what I was receiving with this part. Take a look in this album, there's a video where I'm able to slide a piece of paper under 2 of the corners. Edit: I've found that if you want to fill in the empty spots left by pulling a previous print. You can apply more DnP while the bed is hot and it won't move the DnP that remained around. Edit Again: I was able to use just water to disrupt what remained on the print bed and then re-brush it into a more uniform application. My 2nd print using the same gcode came out much better. Edited 6 time(s). Last edit at 09/23/2018 11:18PM by FA-MAS. First of all, thanks a lot for your thorough feedback, it is much appreciated! From what we see on the pictures and videos it looks like there is a lot of DnP and from what we found out, when you see a “crust” when pulling out the part, it means there is too much. As you pointed out, re-brushing off the DnP on the bed will re-activate its adhesive properties, and you can keep on printing over it, you might have to add a bit of fresh DnP in between prints. This Is what makes DnP a cost-effective solution. We are away for the week, exceptionally all of us at DnP, but next week we will update videos on how we setup the bed using the DnP. If you find news ways of applying DnP, please let us know, it will be our pleasure to try it out and upload videos about it. On my second application, I was able to dilute and spread around what was already on the bed. I was able to get a much more even application. Barely any of it went with the part when it was removed. It also seemed to do better with corners lifting, only one did, and very slightly. When the part came loose, there was the bottom finish was much better. Edited 1 time(s). Last edit at 09/24/2018 09:18AM by FA-MAS. Thanks again Fa-mas for your quick reply, have you tried increasing the bed temperature? The higher the bed temp the higher the DnP adhesion. Hope all is well on your end with the DustnPrint. If you have questions, or suggestions, let us know. Well, I decided to give this stuff a try. I'm having reasonable success with ABS slurry, and I do like the nice smooth results from having clear ABS slurry on the bed to print on, but I'd like something that I don't have to cut off, and the slurry leaves stuff on the print bed when it's done that's difficult to remove. I placed my order about 15 minutes ago. Any more results using this product for ABS ? MKSA, seems no one answered your questions about the DnP, we will be exhibiting DustnPrint at the mini maker fair here in Montreal, November the 16 and 17. It will be our first Maker Fair, stay tuned. The method Francois applies the DnP is new to us, and we cannot wait to try it out, seems much easier than the ones we use...which is good . We wish to thank him for the review, also want to thank Fa-MAs again for sharing a review with everyone, it means everything to us . Hope this will help few looking on reviews for the DustnPrint. We have updated our website to include some videos on how to apply the DustnPrint on the bed. PS: Product is also available on amazon!